Another great find on craigslist.org ... 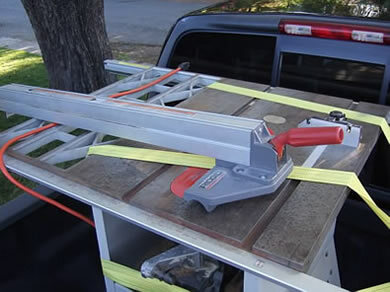 I found a guy who was getting rid of his Ridgid TS2424 10" table saw for $150. I even was able to talk him down to $125 because it is missing a left wing. This deal gets even better... this table saw comes with the HERC-U-LIFT lift mobile base. That it self sells for over $100 on ebay. And one last thing, in additions to the original 40 teeth carbide ridgid that's mounted to the table already. He threw in Freud Diablo 60 teeth finishing blade too and that is a $50 blade!